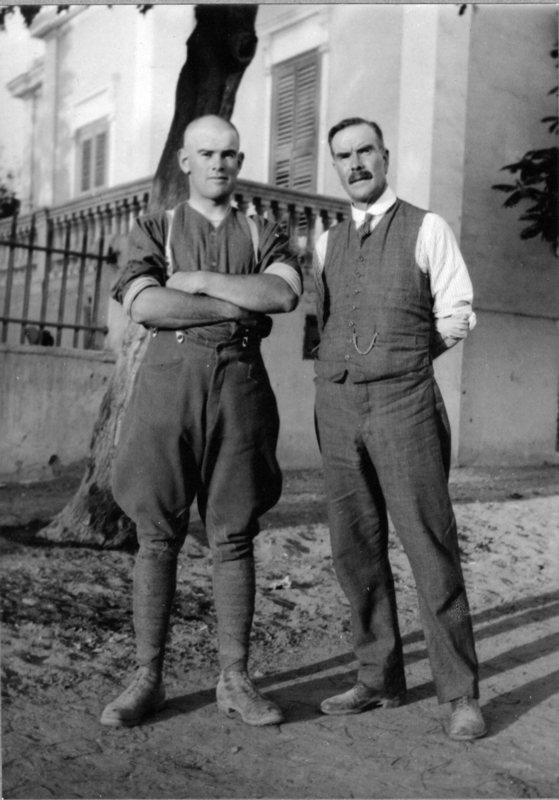 Norman Cameron with his father, Masterton farmer Donald John Cameron, in Egypt, 1915. Norman Donald Cameron was a keen young territorial officer with the Wellington (East Coast) Mounted Rifles, promoted to captain at the age of 20 when war broke out. His father, Donald, had earlier been a local Volunteer soldier. Born in 1893 at Black Rock, he moved with the family in 1904 to ‘Sherwood’ at Upper Plain, Masterton. Norman attended Fernridge School and Wellington College before returning to farm at ‘Sherwood’. He played rugby for the Red Star Club. Norman enlisted in Masterton, joining the Wellington Mounted Rifles, service number 11/216. He helped assemble recruits and on 13 August 1914 led the first mounted rifles group of 32 into camp at Palmerston North. He was made a lieutenant in the NZEF and went overseas to Egypt, where his father visited him. The Mounted Rifles Brigade remained in Egypt when the infantry of the Anzac Division sailed to Gallipoli to land on 25 April 1915. With casualties in the Battle of the Landing so heavy, the Mediterranean Expeditionary Force decided to use the New Zealand Mounted Rifles and the Australian Light Horse as infantry reinforcements. Norman and 470 men of the Wellington Mounted Rifles landed at Anzac Cove on 12 May and the regiment went into the line at Russell’s Top (part of Walker’s Ridge) the next day. Trenches held by the Auckland and Wellington Mounted Rifles on Russell’s Top were heavily attacked by the Turks on May 19. The defenders killed thousands by rifle and machine gun fire and several days later the Turks asked for an armistice to bury the dead. No.3 Outpost, a position north of the Anzac perimeter, was occupied by Turkish snipers. It was attacked by the Canterbury Mounted Rifles on the night of 28 May. After evicting the Turks, the Canterburys were relieved by the Wellington Mounteds, including Norman Cameron. A large Turkish force counterattacked during the night and by daylight, it became obvious the New Zealanders were occupying an isolated position dominated by Turkish fire. After unsuccessful daylight attempts to reinforce No. 3 Outpost, the depleted Wellingtons were relieved on the night of 30 May and shortly after, the position was abandoned. Norman Cameron, along with three officers and 15 men of the Wellington Mounteds, did not survive the ill-planned battle. Another 50 men of the unit were wounded. As the position remained in Turkish hands, Norman’s body was not recovered and he is memorialised on the Lone Pine Memorial at Gallipoli. After the war, Norman’s father and uncle donated 14 acres in Dixon Street which became Cameron and Soldiers’ Memorial Park.